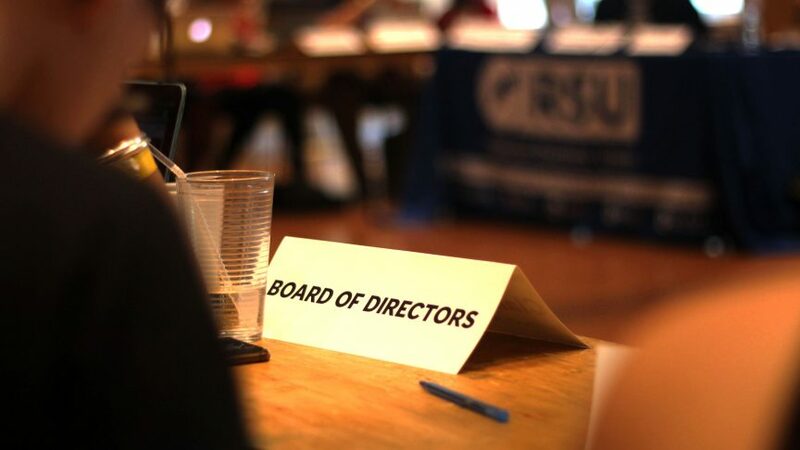 The Ryerson Students’ Union (RSU) July 19 board meeting was marked by sharp divides on issues such as the “Colonialism 150” campaign and a motion to suspend partnerships with the University of Toronto Students’ Union (UTSU). RSU Vice-President Equity Camryn Harlick began the meeting with a statement about their decision to start the “Colonialism 150” campaign while there was a smudging ceremony, a ritual smoke cleansing used to purify a space. Harlick also addressed impeachment rumors that have been circulating since the “Colonialism 150” statement was posted on the RSU’s Facebook page. 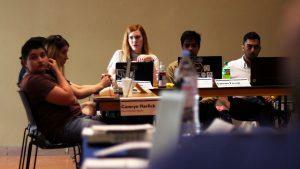 They also said that only one of the 42 board members reached out to them for more information on the campaign. 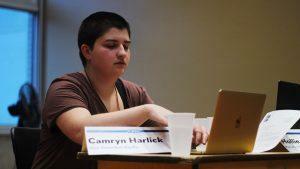 Harlick said in response to their statement they received numerous death threats, which they read aloud. Harlick finished their speech by stating that they had received more votes than any other RSU executive and asked that the board start working together no matter what slates they ran on in the RSU elections. Following Harlick’s speech, the motion to appoint Ryan Culpepper as chairperson for the meeting failed, and so the chair position reverted back to RSU President Susanne Nyaga. Yousaf challenged Nyaga’s appointment, and said the board should vote Osman Hamid as the chair since at the last board meeting Hamid was initially voted in as permanent chairperson. However that meeting was ruled out of order and therefore the motion didn’t count. Nyaga said that only the president can appoint a chair, and Hamid wasn’t even present at the meeting. Yousaf offered to call Hamid so he could head over. The tension in the room grew as board member Gabby Skwarko said, “Do you have him on speed dial?” Yousaf’s challenge was rejected and the meeting continued with Nyaga as chair. Nyaga presented a motion to suspend all work and collaboration with UTSU in relation to the union’s ongoing lawsuit with former UTSU employee Sandy Hudson. Nyaga said the way Hudson has been treated is anti-Black. Board member Salman Faruqi then brought forward a letter from UTSU that stated why the union chose to pursue a lawsuit against Hudson. The statement was directed towards the RSU executive team, but it was only sent to vice-president student life & events Lauren Emberson. According to the letter, the allegations against Hudson are that she solicited her own termination to receive severance pay and that she allegedly claimed more than 2,000 hours of work that UTSU believes she is not entitled to. The union is seeking to reclaim $277,508.62. When questioned as to why Emberson didn’t send the letter to the rest of the board before the meeting, Emberson said she “honestly forgot about it.” The letter was sent on June 12. Vice-president education Daniel Lis said that working with UTSU is important to his U-Pass project which aims to provide students with affordable public transit, and that the RSU wouldn’t be able to progress as well on its own. “Black lives are a little more important than Upass,” said Nyaga. The board voted against the motion in a secret ballot. “Let’s continue wth this agenda, because I want to get out of this anti-black space,” Nyaga says. Emberson presented the motion that if approved, would require the RSU to not participate in any Canadian Federation of Students’ (CFS)-related campaigns, not purchase any goods from them or provide them with any money that isn’t from membership fees. “I don’t see the federation serving students,” Emberson said, citing the CFS’s hidden bank account and how there was no access given to view the audit of the bank account. The CFS is Canada’s largest student-advocacy group that represents students on a provincial and national level, and that the RSU pays an annual membership fee of $500,000. Some board members brought up how the RSU would still have to pay the membership fee if this motion passes, but they wouldn’t take advantage of the free campaign materials such as posters, signs or buttons. “We are not going to give them money for campaigns when we are already giving them half a million dollars a year,” says Emberson. 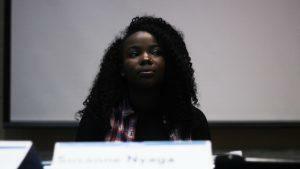 When discussion of defederating from the CFS came up, Nyaga said only the student levy goes to the CFS and if the RSU did defederate it wouldn’t be saving them money. 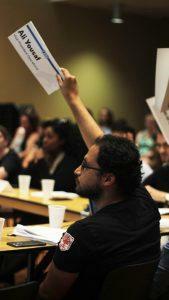 After Talena Jackson-Martineau and Ammar Akhtar were ratified as the graduate student representatives for the school year, the board passed a motion for the RSU to support and work with graduate students to hold a referendum to create a graduate student union at Ryerson. If the referendum is successful, the board will participate in negotiations with the new graduate union to facilitate their separation from the RSU. After citing health and safety concerns since some of the RSU’s office chairs are over 10 years old, the board passed a motion to approve up to $13,000 to purchase 60 new chairs. According to RSU General Manager Sid Naidu, $20,000 was previously spent on renovations on the new Wellness Centre, but they were mostly aesthetic changes. The board passed a motion to approve up to an additional $18,000 to complete the construction and to ensure it complies with building and safety standards. Naidu said the Wellness Centre will be completed next month. The centre, which will provide extra direction for students to access mental health resources, was initially set to open in September 2016 but it was delayed. This $20,000 was only for construction costs, however. There was (a crapload) more allocated to advertising, supplies, etc on top of that. After their student group status was previously denied due to issues with funding and similarities with existing Christian groups on Ryerson campus, the UBF lost its appeal and will not be an official student group. Board member Claire Davis has just mentioned that UBF groups in the United States are on a “cult watch” list. She is against this motion. Board member Sameer Naumani was elected as sustainability commissioner, and board members Elizabeth Bala, Matthew Catangui and Sophie Lafleur were elected as part of the RSU’s sustainability committee. Additionally, board member Youssef Helmy was elected as transit commissioner, and board members Razi Syed, Nathan Fernandes and Maryan Issa were elected as part of the transit committee.